Bring your own (mobile) device, or BYOD, is a rising trend, and with good reason – the business benefits and the increase in employee effectiveness are too big to ignore. However, it’s all too easy to get bogged down in the details, like mobile OS versions, device types, location, allowed apps, etc. -- not to mention malware infection and jail breaking/rooting risks. This presentation will offer a strategic, or holistic, vision for BYOD that focuses on a new framework for successful deployment: connect, protect, and manage. The framework allows you to focus on the most important piece of your overall security strategy – policy – while controlling your risk and staying compliant. We will also discuss the relevance of some of the latest findings of our mobile threat center research. Juniper Networks is in the business of network innovation. We believe the network is the single greatest vehicle for knowledge, understanding and human achievement the world has ever known. Juniper believes that learning settings must enable students and educators to analyze, communicate and collaborate globally to improve student outcomes that will impact our nation’s economy. Join Adaptive and Juniper for the “Build the Best in Education with Juniper Networks,” virtual event, presented by Oliver Schuermann, Director of Government, Education and Emerging Solutions at Juniper. In the presentation, Adaptive will present a customer case study from a recent deployment at Wesleyan University in Connecticut. The case study will detail the university’s decision to switch from their previous solution, and will also share the progress that has been made since implementing Juniper on their campus. Adaptive Communications recently hosted internationally-recognized business expert Scott McKain, who delivered his "Ultimate Customer Experience" presentation. McKain shared his distinctive advice on creating compelling connections between you and your customers, and how to stand out and move up, regardless of the economic climate in the industry. Adaptive truly benefited from Scott's dynamic presentation and wanted to share one of his many examples of great customer service. Here, McKain shares his famous "Taxi Terry" story with one of his audiences. 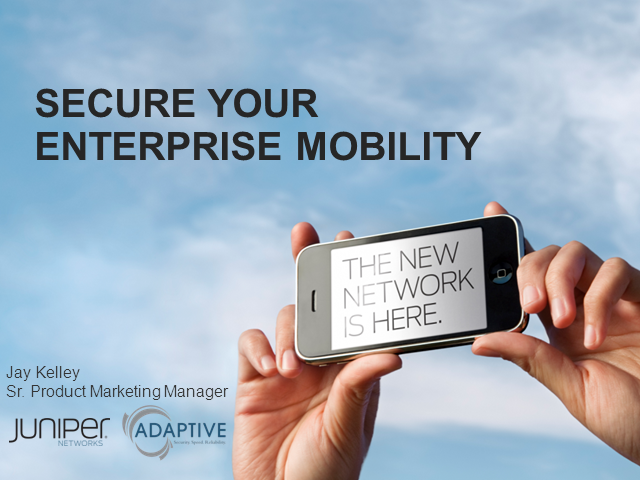 Mobility is great for your business, right? Employees can be much more productive, anywhere, at any time! But as you consider a ‘Bring Your Own Device’ (BYOD) program for your employees, you need to consider the risk to your business data and applications. Mobile devices are fast becoming the new vector for malware, interception and compromise, as reported in our recent research reports. What if the wireless access point an employee connects to at the local coffee shop is actually a rogue access point? And, what happens if one of your employees loses a smartphone or tablet, or even worse, it is stolen? What about that business e-mail and sensitive document, or mobile login for your business applications. Is that information safe? This session examines how to ensure that your employees’ personal or business mobile devices are safe and protected, while allowing you to reap the productivity gains offered by BYOD. When it comes to cloud computing, security has been one of the biggest inhibitors for businesses. While traditional security architectures (such as network-based firewalls and intrusion prevention system devices) are essential to the security of the physical network of the cloud, they provide no visibility into the traffic generated in the virtualized part of the network (e.g., traffic between virtual machines in the data center's host virtualization servers). To provide proper protections for the cloud, it is necessary to address the most significant underlying technology of the cloud: virtualization of workloads and servers. > And this is exactly what Juniper Networks vGW Virtual Gateway does. vGW is a comprehensive, hypervisor-based, virtualization security solution that was purpose-built for cloud environments. Join us to learn more about how vGW delivers total virtual data center protection and cloud security through visibility into the virtualized environment, multiple layers of protection, and a complete set of compliance tools-all things your customers will require with their move to the cloud. What threats do mobile devices pose to your network? Since 1997, Adaptive Communications has been committed to providing the best solutions to enterprise clients in the Eastern United States.